This entry was posted on September 24, 2018 by Allison Holland. Here's another colourful craft project for children from Cara Barrell. 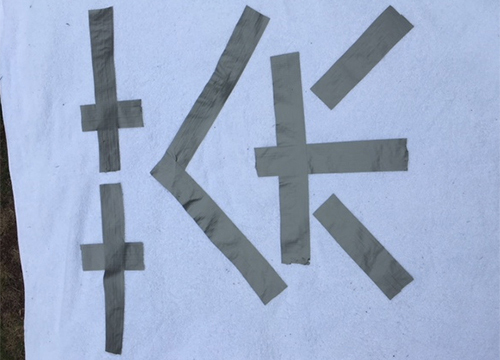 These personalised towels were created using a waterproof adhesive tape as a resist and Procion MX fibre reactive dyes. Procion MX dyes are formulated specifically for dyeing natural plant fibres such as cotton and linen. They are permanently fixed to the fabric when combined with soda ash. Soda ash changes the pH of the dyebath so that the dye reacts with the fibre to make a permanent bond. The new 100% cotton towels were first washed to remove any soiling or dressing. The damp towels were then soaked in a solution of soda ash. You will need 20g soda ash per litre of water and approximately 2 litres of water for every 100g of dry fabric. 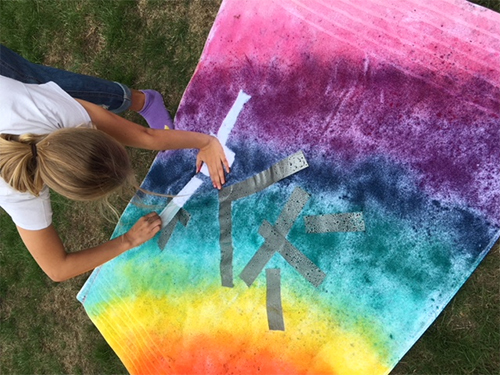 When the towels were dry, Cara and the children set out their designs on the fabric with the waterproof adhesive tape. The dyes were prepared in plastic trigger spray bottles. 150ml of hot tap water was poured into the bottle with 2-4 teaspoons of dye powder and shaken until fully dissolved. 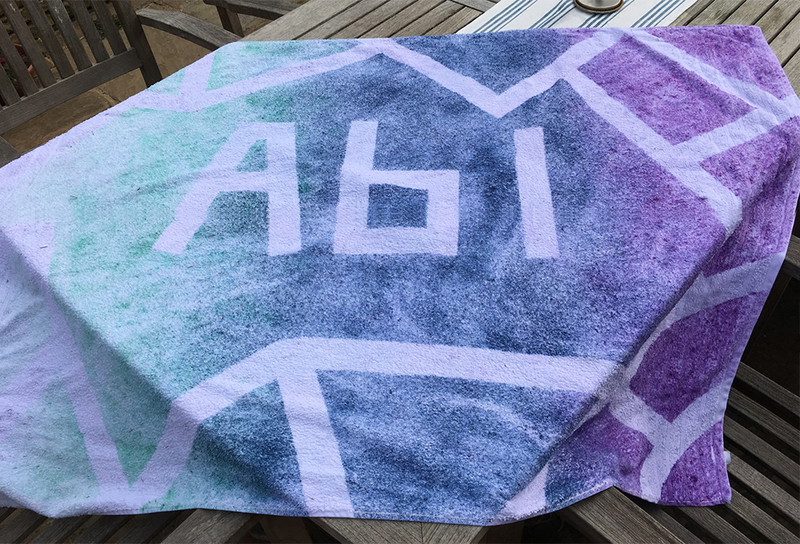 You can make up as many dye colours are you like although Abi (see her towel below) decided to use just the three. Notice how the colours overlap to create new shades; turquoise + blue = teal, blue + violet = purple. This project is a fun way for children to discover colour mixing. Using just red, yellow and blue would result in orange and green; red + yellow = orange, yellow + blue = green. 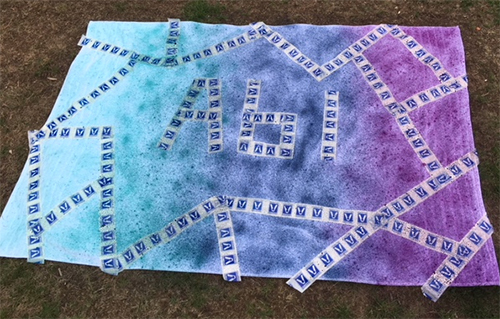 The tape was removed and the towels were hung up to dry before washing out the excess dye and revealing the finished design! 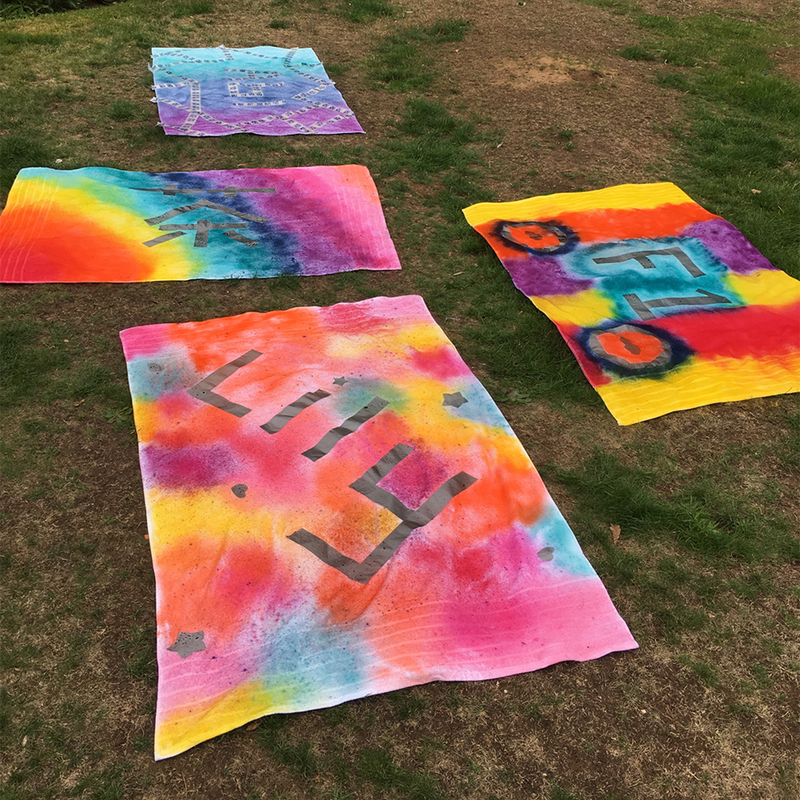 See Cara's other two projects using Procion MX dyes Tie-dye Pillowcases with Children and Tie-dyeing Onesies using Jacquard Procion MX dyes).